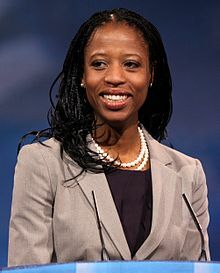 Ludmya "Mia" Love (née Bourdeau; December 6, 1975) is an American politician who served as the U.S. Representative for Utah's 4th congressional district from 2015 to 2019. A Haitian American, Love was the first black female Republican elected to Congress. Love was born to Haitian parents in the New York City borough of Brooklyn. She was elected mayor of Saratoga Springs, Utah in 2010, having previously served on its City Council. Love spoke at the 2012 Republican National Convention. In 2012, Love ran for Congress in Utah's 4th congressional district, losing narrowly to incumbent Democratic Party U.S. Representative Jim Matheson. Love ran for Congress again and was elected on November 4, 2014, defeating Democratic opponent Doug Owens; she fended off Owens a second time to win re-election in 2016. She ran for re-election in 2018, but was defeated by Democrat Ben McAdams, losing to McAdams by less than 700 votes out of over 250,000 cast. Love was born Ludmya Bourdeau on December 6, 1975, in the New York City borough of Brooklyn, the daughter of Mary and Jean Maxine Bourdeau. At a time of political repression, her parents emigrated together from Haiti in 1973, leaving their two older children behind with family. Her father had been threatened by the Tonton Macoute, the secret police in Haiti, and her parents traveled to the United States on a tourist visa. They spoke no English when they arrived. Her father became a paint-company manager and her mother worked as a nurse. Love's birth enabled her parents to gain a U.S. residency permit (green card) under an immigration law that favored immigrants from the Western Hemisphere who had a child born in the United States; the law expired in early 1976. They later became naturalized citizens. When Love was five, her family moved from Brooklyn to Norwalk, Connecticut. Love attended Norwalk High School. She was raised as a Roman Catholic in the faith of her parents. After the family settled in Norwalk, her parents brought her older siblings from Haiti to reunite the family. Love attended the University of Hartford Hartt School with a half-tuition scholarship. She graduated with a degree in musical theatre. After college, she worked at Sento Corporation and the Echopass Corporation. She was also a flight attendant with Continental Airlines. She moved to Utah in 1998 after converting to The Church of Jesus Christ of Latter-day Saints and while working for Continental. There she married Jason Love. Love began to be active in civic affairs when she served as the community spokesperson in Saratoga Springs, Utah in an effort to persuade the developer of her neighborhood to spray against flies. The city of 18,000 near Salt Lake City was established in 1997 and has had rapid growth. In 2003 Love won a seat on the Saratoga Springs City Council. She was the first female Haitian-American elected official in Utah County; she took office in January 2004. During an economic downturn, as part of the city council Love approved a transition from the agriculture tax to municipal tax. She worked with other city council members to cut expenses, reducing the city's shortfall during the economic downturn from $3.5 million to $779,000. Saratoga Springs now has the highest possible bond rating for a city of its size. After six years on the Council, Love was elected mayor, winning with 861 votes to 594 for her opponent Jeff Francom. She served from January 2010 to January 2014. During her term, Love led the city in dealing with natural disasters, including a wildfire, followed shortly afterward by a severe mudslide. Love ran in Utah's 4th congressional district, which was created after the 2010 Census. She competed for the Republican nomination against attorney Jay Cobb and State Reps. Stephen Sandstrom of Orem and Carl Wimmer of Herriman; she won the nomination on April 21, 2012, at the 2012 Utah Republican Party Convention with over 70 percent of the vote. On December 15, 2011, six-term Democratic 2nd district incumbent Jim Matheson announced that he would run for the newly created seat in the 4th congressional district, meaning there would be an open-seat race for the 2nd district. Due to redistricting, the 2nd district race was not expected to be competitive for Democrats, due to its losing many of its reliably Democratic constituents. Nationally, Love received campaign support from 2012 Republican presidential nominee Mitt Romney and his wife Ann Romney, House Majority Leader Eric Cantor, House Budget Committee Chairman and 2012 Republican vice presidential nominee Paul Ryan, and Speaker of the House John Boehner. Then-Congressman Jason Chaffetz (UT-3), a Republican, declined to give her his primary endorsement. In 2012, National Journal named Love one of ten Republicans to follow on Twitter. When speaking to the 2012 Republican National Convention on August 28, 2012, she discussed lessons learned from her parents, immigrants from Haiti who fled political repression. She said, "Mr. President, I am here to tell you we are not buying what you are selling in 2012." In September 2012, questions arose about her parents' immigrant status. Forbes investigated a claim in an article that month in Mother Jones that no law existed in 1976 that would have allowed Love's parents to become citizens of the United States after her birth. Forbes found that immigrants who had been residents of the Western Hemisphere could get long-term residency permits (green cards) if they had a child born in the United States. Mother Jones issued a correction. In an October 2012 interview, her father said that Mia's birth as a U.S. citizen was key to him and his wife gaining permanent legal status and ultimately citizenship. Love lost the three-way election to Jim Matheson by 768 votes out of 245,277 votes cast, a difference of 0.31%. Jim Vein (Libertarian), had garnered 6,439 votes. She was regarded to have run a weak campaign, switching campaign managers three times, trying to "nationalize" the race rather than focus on local issues, and missing interviews and appointments, ostensibly because of rifts within her campaign staff. Mia Love at the 2013 CPAC in Washington D.C. In March 2013, Love said she was seriously considering another run against Matheson. In May 2013 she announced she would run in 2014. As of July 2013[update], Love had raised over $475,000 for her campaign. Love was an opening speaker at the 2013 Western Conservative Summit. She spoke of the need for increased grassroots organization in the GOP, and the need to be independent from the government. In August 2013, Love was chosen by Newsmax as an "Up and Comer" in their list of top "25 Influential Women of the GOP", given her visible position as a young black female Republican. In November 2013, Love acknowledged the growing consensus that the Tea Party needed to shift away from being the "party of no", disagreeing with its part in forcing a federal government shutdown over the budget. She later reiterated her support for the philosophy of the Tea Party and many of its leaders, including Utah Sen. Mike Lee. On December 17, 2013, Matheson announced that he would not run for re-election. Love was ranked as the favored candidate due to her name recognition and characteristics of the district. In early October 2014, the National Journal listed Utah's 4th district as the number one most likely district to change hands in November. In early 2014 Love was made a member of the Republican National Committee's National Advisory Council on African-American outreach. On April 26, 2014 Love won the Republican nomination for the 4th congressional district at the Utah Republican Convention, with 78% of the vote at the convention. [verification needed] The Democratic Party nominee was Doug Owens, son of former 4th District four term-Democratic Representative Wayne Owens. On election day, Owens led Love in the vote count until late in the evening, when she pulled ahead and ultimately won by more than 7,000 votes. Reacting to her victory, Love took a shot at the media's perceived obsession with identity politics, joking to her supporters: "Many of the naysayers out there said that Utah would never elect a black, Republican, LDS woman to Congress. Not only did we do it, we were the first to do it." Love ran for re-election in 2016. She again defeated Democrat Doug Owens in the general election with 54% of the vote, over 12 points ahead of Owens. David Scott, a Democratic Representative from Georgia, had given $1,000 to Love's campaign. Love was challenged by Salt Lake City Mayor, Democrat Ben McAdams in 2018. In June 2018, CNN stated that the race was considered "consequential to both parties" because Love had "stood up to [President Donald Trump] on immigration" and "because national Democrats [saw] McAdams as one of their best chances to gain a foothold on red turf." For several months prior to the election, the match had been rated as a tossup by FiveThirtyEight, RealClearPolitics, and the Cook Political Report Two polls performed in October showed McAdams and Love tied, with either 45% or 46% support each, and remaining respondents undecided. For two weeks after the election, the race was too close to call but McAdams was declared the winner on November 20, 2018, defeating Love by 694 votes. The margin was .258%, barely over the .25% threshold that would have permitted Love to request a recount. In her concession speech, Love was critical of President Donald Trump, saying he had "no real relationships, just convenient transactions." She also criticized the Republican Party for having a "transactional" relationship with minority voters. Love's comments came after a news conference in which Trump mocked Love, even before all the ballots had been counted. He said "Mia Love gave me no love, and she lost." Mia Love speaking at the 2015 Conservative Political Action Conference (CPAC) in National Harbor, Maryland on February 26, 2015. With the start of the 2015 Congress, Love was appointed to the House Financial Services Committee. Love joined the Congressional Black Caucus after taking her seat. While campaigning in 2012, Love had said that if elected, she would "join the Congressional Black Caucus and try to take that thing apart from the inside out." She described the mainly Democratic Caucus as characterized by "demagoguery. They sit there and ignite emotions and ignite racism when there isn't. They use their positions to instill fear. Hope and change is turned into fear and blame. Fear that everybody is going to lose everything and blaming Congress for everything instead of taking responsibility." She later acknowledged the bonds created with fellow caucus members. "As the only female Republican member of the Congressional Black Caucus, I have the opportunity every day to work across the aisle on issues that are divisive but important," she said. "My faith and my belief in the humanity of every one of God's children helps me to work with my Congressional Black Caucus colleagues on important issues like criminal justice reform." In May 2015, she was a lead sponsor along with Duncan D. Hunter of HR 2518 the Student Right to Know Before You Go Act, designed to increase the amount of information universities and colleges are required to provide prospective students. In October 2015, Love was named to serve on the Select Investigative Panel on Planned Parenthood. In April 2016, Love got her first bill through the U.S. House. Bill HR3791, which was approved in a 247–171 vote, raised limits on how large community banks can grow; Love asserted that the move would make more credit available. In December 2017, Love introduced the Stop Taxpayers Obligations to Perpetrators of Sexual Harassment Act. Passed by the U.S. House in February 2018, the bill would prevent members of Congress from settling sexual harassment claims with taxpayer money. In March 2018, Love became a supporter of creating federal laws against pyramid schemes. She also supported adding multi-vitamins to the list of items that could be purchased with food stamps. Love has called on the U.S. Department of Education to allow state regulation of student loan providers. In May 2018, a defense bill included language that was co-authored by Love. The language required the military to evaluate the effects of military policies on investigating service members who bring charges of sexual assault. Also in the spring of 2018, Love signed a discharge petition seeking to force a floor vote on four immigration-related bills. One of the four bills would have prevented the deportation of undocumented immigrants who were brought to the United States as children. This time period actually saw Love advocating on several fronts in relation to immigration. She also was the co-leader with Pramila Jayapal of an effort to keep in place rules that allowed accompanying spouses of H-4 Visa holders to have work authorization while in the United States. In May 2018, Love's Small Bank Holding Company Relief Act became law. Love was a member of the Congressional Western Caucus and the Climate Solutions Caucus. In the lame-duck session of the 115th Congress, Love missed 71 out of 85 votes. She attributed her absence to her need to care for a sick child. It was more than any other congressperson who lost reelection and far more than any of the three other members of Utah's congressional delegation. Love speaking at the 2017 March for Life in Washington, D.C.
Love says she favors "fiscal discipline, limited government, and personal responsibility." Love opposes abortion. In a speech at the 2017 March for Life, she said her parents, immigrants from Haiti, considered aborting her but decided not to do so. Love has a 2% lifetime score from the League of Conservation Voters. In 2012, Love said she would focus on opposing federal regulations, particularly those set by the Environmental Protection Agency. She supports the building of the Keystone XL pipeline. In 2014, she said she opposed the federal regulation of greenhouse gas emissions. By 2017, however, she had become a member of the Climate Solutions Caucus and stated that climate policies and economic growth are not mutually exclusive. Love supports Utah's effort to reclaim public land from federal agency controls. In her 2012 campaign, Love proposed dramatically reducing food entitlement spending like free school lunches and food assistance to pregnant mothers and the poor. She defended these proposed cuts by saying people who are poor will become dependent if they don't work for their food. Love proposed a blueprint that would cut federal spending by $750 billion, with a focus on cutting entitlements like free school lunch, special education funding, subsidized school loans, funds aimed at preventing homelessness, healthcare subsidies, Medicaid spending, and food assistance. She has said her proposed cuts are a "nasty-tasting medicine" needed for the country to run properly. Love believes that the federal government should have less power. Love was described as a Tea Party conservative in 2012. In a 2015 article titled "How 'tea party' is Mia Love? ", the Washington Post wrote that "Love's rhetoric from 2012 to 2014 changed a bit, even as her policy positions remained fairly constant" and noted that Love had "angered some conservatives when she questioned the tea party driven government shutdown in 2013 over Obamacare." A blogger for libertarian-leaning magazine Reason described her as a "Trojan horse libertarian" due to her stance on homeschooling, federal control of land, and other issues. She also supports cutting taxes. She supported cuts to foreign aid and tort reform. Love supported the March 2015 budget, which required an increase in federal employee contributions to their retirement funds. She has promoted the work of the libertarian Cato Institute. She would like to cut the Earned Income Tax Credit in half, and privatize the air traffic control system. For the 2016 election season, Love received about $63,000 in donations from gun lobbyists and was endorsed by the National Rifle Association. In the wake of the Stoneman Douglas High School shooting, Love said she would support raising the minimum age to purchase semiautomatic rifles such as an AR-15 style rifle to age 21. She also stated that she was in favor of banning bump stocks and increasing the level of background checks needed to buy guns. Love favors repealing the Affordable Care Act, reducing federal subsidies towards healthcare, and putting caps on Medicaid spending. Love supports immigration reform. She was a co-sponsor of the Recognizing America's Children Act, which would provide a pathway for DACA recipients to permanently remain in the country. In 2018 Love joined with Democrats in seeking to force immigration-related legislation to a vote on the house floor. In June 2018 she specifically denounced the Trump administration's separation of children from their parents when they crossed into the US under some circumstances. On October 8, 2016, Love issued a statement that she would not vote for Republican nominee Donald Trump in the presidential election, urging him to withdraw from the race for the good of the party and the country. In early 2018, Love joined other Utahn political leaders in expressing opposition to President Trump's proposed tariffs on steel and aluminum. According to political polling and reporting website FiveThirtyEight, Love's votes aligned with Trump's positions around 96% of the time during the 115th Congress. Raised a Roman Catholic, Love joined The Church of Jesus Christ of Latter-day Saints after graduating from college in 1998. While working as a flight attendant, she moved to Utah as part of her work. She also wanted to be closer to a temple and to learn more about her faith. There she got to know Jason Love, whom she had met previously when he was an LDS missionary in Connecticut. The two were married in December 1998, four months after their first date. When first married, the Loves lived in American Fork. They have three children. After her election to Congress, the Loves decided that Jason should continue his software work and maintain the couple's residence in Utah. Their three children continued to attend school in Utah and Love used video calling and frequent return trips to Utah to remain in touch with her family. ^ a b Will, George (September 24, 2012). "Utah's Mia Love Battles Stereotypes". Newsmax.com. Newsmax Media. Archived from the original on November 4, 2014. ^ a b "Rising GOP star Mia Love glides into the spotlight at convention". Fox News. August 28, 2012. Archived from the original on November 5, 2014. ^ "Mia Love Wins Utah Mayoral Race". January 9, 2010. ^ Brent D. Griffiths (November 20, 2018). "Rep. Mia Love loses to Democrat in Utah". Politico. Retrieved November 20, 2018. ^ a b Mencimer, Stephanie (September 24, 2012). "GOP Rising Star Mia Love: "Anchor Baby"?". Mother Jones. Archived from the original on November 5, 2014. ^ Ritz, Erica (September 4, 2013). "Mia Love Asks: 'How Far Away Are We From Losing the American Dream?'". TheBlaze. Archived from the original on November 5, 2014. ^ a b c Anderson, Stuart (September 28, 2012). "Mia Love May Be Right About Her Family's Immigration History". Forbes.com. Archived from the original on November 5, 2014. ^ Mencimer, Stephanie (October 1, 2012). "Mia Love May Have Been Her Parents' "Ticket to America" After All". Mother Jones. Archived from the original on November 5, 2014. ^ a b c d e f g Gehrke, Robert; Canham, Matt (October 8, 2012). "Mia Love: From Dream of Broadway to Capitol Hill". The Salt Lake Tribune. Archived from the original on November 4, 2014. ^ a b Benson, Lee (January 17, 2011). "About Utah: King's dream certainly thrives along the shores of Utah Lake". Deseret News. Archived from the original on November 5, 2014. There was an immigration law in place, however, that would grant the entire family citizenship if Jean Maxine and Mary had a baby in America. But there was a deadline. The law was set to expire on Jan. 1, 1976. On Dec. 6, 1975, with 25 days to spare, Mia was born in a Brooklyn hospital. ^ Hesterman, Billy (January 6, 2012). "Saratoga Springs Mayor Mia Love Officially Enters Congressional Race". Provo Daily Herald. Archived from the original on November 5, 2012. ^ Glionna, Hohn M.; Pearce, Matt (November 5, 2014). "GOP hopes Mia Love's win a watershed moment for the party". LA Times. Archived from the original on November 15, 2014. ^ Dougherty, Joseph M. (January 15, 2010). "Mayor Mia Love honors Martin Luther King Jr. in speech". Deseret News. Archived from the original on November 4, 2014. ^ Canham, Matt (November 23, 2014). "Mia Love: Searching for stardom; a Mormon conversion". Salt Lake Tribune. Archived from the original on November 24, 2014. ^ a b Haddock, Sharon (September 27, 2004). "Political Novice Lovin' it". Deseret News. Archived from the original on November 5, 2014. ^ Rolly, Paul (November 19, 2011). "Mia Love causing a GOP stir nationally". The Salt Lake Tribune. Archived from the original on November 4, 2014. ^ a b Levinson, Alexis (January 14, 2012). "Aspiring first black GOP congresswoman: Don't put me in a box". The Daily Caller. Archived from the original on November 5, 2014. ^ Myers, Donald W. (November 9, 2009). "Mia Love: Race not a factor for Utah's first black female mayor-elect". The Salt Lake Tribune. Archived from the original on November 4, 2014. ^ Allred, Cathy (December 26, 2013). "Mia Love thankful for chance to serve Saratoga Springs". Provo Daily Herald. Archived from the original on December 29, 2013. ^ Gehrke, Robert (January 4, 2012). "Saratoga Springs Mayor Mia Love to kick off campaign". The Salt Lake Tribune. Archived from the original on November 4, 2014. ^ Saulny, Susan (May 22, 2012). "Black Mormons and the Politics of Identity". The New York Times. Archived from the original on November 5, 2014. ^ Canham, Matt (February 1, 2012). "Chaffetz helps Love with Washington introductions, but says he won't endorse". The Salt Lake Tribune. Archived from the original on November 4, 2014. ^ Gehrke, Robert (August 1, 2012). "Love getting boost from national GOP stars". The Salt Lake Tribune. Archived from the original on November 4, 2014. ^ "'Revive' America, Utah congressional candidate Mia Love tells RNC, draws rousing cheers". Deseret News. AP. August 28, 2012. Archived from the original on November 5, 2014. ^ Gehrke, Robert (September 24, 2012). "Love's story of immigrant parents called into question". The Salt Lake Tribune. Archived from the original on November 4, 2014. ^ "Jim Matheson ekes out incredibly close race over Mia Love in 4th District race". ^ a b c d Rolly, Paul (July 21, 2012). "Mia Love's campaign is all in tangles". The Salt Lake Tribune. Archived from the original on December 12, 2014. ^ Chasmar, Jessica (March 17, 2013). "GOP Mayor Mia Love thinking about another run for Congress". The Washington Times. Archived from the original on November 5, 2014. ^ Joseph, Cameron (July 15, 2013). "Mia Love raises $475K for House rematch". The Hill. Archived from the original on November 5, 2014. ^ Patane, Matthew (July 27, 2013). "Wisconsin Gov. Scott Walker opens Western Conservative Summit". The Denver Post. Archived from the original on November 5, 2014. ^ Patten, David A. (August 2013). "25 Influential Women of the GOP". Newsmax. Archived from the original on November 5, 2014. ^ Roche, Lisa Riley (November 13, 2013). "Mia Love says I Don't Believe in Labels". Deseret News. Archived from the original on November 5, 2014. ^ Hallowell, Billy A. (November 27, 2013). "Conservative Star Mia Love Denies Report That She Rejects the 'Tea Party' Label — and Clarifies Her Stance". TheBlaze. Archived from the original on November 5, 2014. ^ Fitzpatrick, Jack (October 8, 2014). "The Hotline's House Race Rankings: The 30 Districts Most Likely to Change Hands in November". National Journal Hotline. National Journal. Archived from the original on November 5, 2014. ^ "RNC's advisory councils to focus on minority communities". Florida Courier. March 6, 2014. Archived from the original on November 5, 2014. ^ Another Owens Jumps into Utah Politics, UtahPolicy.com, Bob Bernick, January 27, 2014. Retrieved January 8, 2019. ^ Bouie, Jamelle. "Mia Love's Immigrant Rhetoric." The New Yorker. November 29, 2014. Retrieved 2017-07-24. ^ Canham, Matt (November 8, 2016). "Doug Owens concedes; Mia Love has 'never been more proud of this state,' which she'll serve in a 2nd term". Salt Lake Tribune. Retrieved November 11, 2016. ^ Meyer, Theodoric (March 24, 2016). "Utah GOP plots to save Mia Love from Trump backlash". Politico. Retrieved May 24, 2016. ^ http://www.washingtontimes.com, The Washington Times. "David Scott, Georgia Democrat, donated $1,000 to campaign Mia Love, Utah Republican: report". Retrieved September 11, 2016. ^ "The real race to watch in Utah this November is not Mitt Romney's -- it's Mia Love's". ^ a b "Utah 4th". FiveThirtyEight. August 16, 2018. Retrieved October 27, 2018. ^ "Utah 4th District - Love vs. McAdams". RealClearPolitics. Retrieved August 23, 2018. ^ "2018 House Race ratings". Cook Political Report. Retrieved October 27, 2018. ^ "It's over. Democrat Ben McAdams ousts Republican Rep Mia Love by 694 votes". The Salt Lake Tribune. Retrieved November 21, 2018. ^ Cole, Devan (November 26, 2018). "Mia Love slams Trump in concession speech: 'No real relationships, just convenient transactions'". CNN. Retrieved November 27, 2018. ^ Ember, Sydney (November 26, 2018). "Mia Love Criticizes Trump in Scathing Concession Speech". New York Times. Retrieved November 27, 2018. ^ Canham, Matt (November 21, 2014). "Utah's Mia Love on committee overseeing banks". The Salt Lake Tribune. Archived from the original on January 27, 2015. ^ Ross, Chuck (January 6, 2015). "Republican Mia Love Joins Congressional Black Caucus, Group She Wants To Reform". The Daily Caller. Archived from the original on January 27, 2015. ^ Romboy, Dennis (January 5, 2012). "Love would 'take apart' Congressional Black Caucus if elected in Utah's 4th District". Deseret News. Archived from the original on November 5, 2014. ^ Love, Mia (March 31, 2018). "Recognize that diversity gives us strength". Deseret News. ^ Glum, Julia (March 22, 2015). "Mia Love's 'Student Right To Know Before You Go' Act Pushes Colleges To Provide More Data". International Business Times. Retrieved January 2, 2018. ^ Roche, Lisa Riley (April 15, 2016). "Rep. Mia Love gets first bill through House". Deseret News. Retrieved April 29, 2016. ^ Francis, Simone (February 6, 2018). "House votes to force lawmakers to pay for their own sexual harassment settlements". Good4Utah.com. Associated Press. Retrieved March 4, 2018. ^ "Mia Love: Protecting Utah direct sellers from pyramid fraud". March 10, 2018. ^ "Fate of Multivitamins for SNAP Recipients Being Debated in House - Whole Foods Magazine". May 17, 2018. ^ Release, Press. "Rep. Love joins bipartisan challenge to Ed. Department's attempt to block state consumer protection laws". ^ Release, Press. "Love, Kuster, Dingell language to address military sexual assault passed as part of NDAA". ^ Editor, Bryan Schott, Managing. "Love says she's not being pressured by GOP leadership to back off push for immigration vote". ^ Reporter, SUNITA SOHRABJI, India-West Staff. "130 Members of Congress, Led by Rep. Pramila Jayapal, Urge DHS to Retain Work Authorization for H-4 Visa Holders". ^ "Rep. Mia Love's lending bill signed into law". May 24, 2018. ^ "Rep. Mia Love Representative for Utah's 4th District". GovTrack. ^ "Rep. Mia Love skips 83% of votes in the shutdown session, most of any ousted lawmaker". KUTV. December 27, 2018. ^ a b Dobner, Jennifer (May 24, 2014). "Republican star Mia Love gets second chance to make political history". Reuters. Retrieved April 29, 2016. ^ "Mia Love Delivers Heartfelt Speech at March for Life". January 27, 2017. ^ OnTheIssues.org. "Mia Love on the Issues". www.ontheissues.org. Retrieved January 14, 2018. ^ "Love: We can find climate solutions and have a thriving economy". ^ a b c d e "Mia Love's budget plan: Do her deep cuts go too far?". The Salt Lake Tribune. Retrieved January 14, 2018. ^ Henderson, Nia-Malika (January 8, 2015). "How 'tea party' is Mia Love?". Washington Post. Retrieved April 29, 2016. ^ Quinn, Garrett (November 2012). "Libertarian(ish) Candidates". Reason Magazine. Retrieved April 29, 2016. ^ "The gun lobby: See how much your representative gets". POLITICO. Retrieved January 14, 2018. ^ NRA-ILA. "NRA-ILA | NRA Endorses Mia Love for U.S. House in Utah's 4th Congressional District". NRA-ILA. Retrieved January 14, 2018. ^ "Utah Representatives Mia Love and John Curtis Proposing Gun Control". February 26, 2018. ^ "Rep. Mia Love: 'Everything has to be on the table' after Florida school shooting - KSL.com". ^ Smart, Christopher (December 5, 2017). "Utah Rep. Mia Love: Keep Dreamers in 'the only country they know'". The Salt Lake Tribune. Retrieved December 6, 2017. ^ Roche, Lisa Riley (June 18, 2018). "Rep. Mia Love pushing bill to end 'horrible' separation of families at border". ^ Levintova, Hannah (October 8, 2016). "Here are all the Republicans who have abandoned Trump's ship so far". Mother Jones. Retrieved October 8, 2016. ^ Raymond, Art (March 6, 2018). "Utah political leaders join chorus of naysayers on Trump tariff terms". ^ "Tracking Congress In The Age Of Trump". January 30, 2017. Retrieved October 27, 2018. ^ Love, David A. (December 18, 2013). "Mia Love poised to make a political comeback". The Grio. Archived from the original on November 5, 2014. ^ Fund, John (April 22, 2012). "Daughter of Haitian Immigrants is GOP Congressional Nominee in Utah". National Review Online. National Review. Archived from the original on November 5, 2014. ^ Robinson, Doug (January 3, 2015). "Mr. (Mia) Love – The man behind the congresswoman". Deseret News. Archived from the original on January 27, 2015. ^ Connolly, Griffin; Connolly, Griffin (January 7, 2019). "Former Reps. Mia Love, Luis Gutiérrez join CNN as commentators". Roll Call. Retrieved January 11, 2019. Gilgoff, Dan (May 1, 2012). "House candidate and rising GOP star is black, female – and Mormon". CNN. Archived from the original on November 4, 2014. Wikimedia Commons has media related to Mia Love.